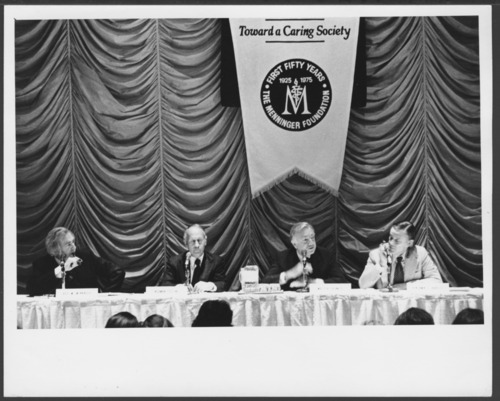 Dr. Roy Menninger, Norman Cousins, Walter Cronkite and Ben Bradlee (editor of the Washington Post) are shown at the Menninger Foundation Convocation "Toward a Caring Society", held at the Waldorf-Astoria in New York City. This was part of the 50th Anniversary celebration of the Menninger Clinic. Menninger Foundation convocation "Toward a Caring Society"